That round black table is the one my grandmother used when she did bobbin lace. And then, below, I added some more colour in the unbleached linen. 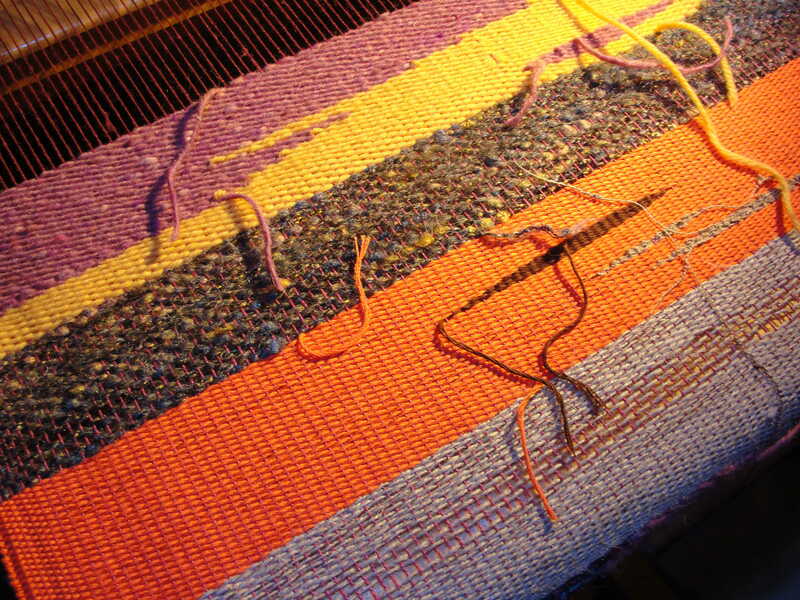 Here and there I try not to beat the weft quite as consistently, to get a more open and irregular look. You can see that in the top third of the linen band below. Part of me loves the randomness and open look of this, and another part of me is bothered by it. I like the saori-ness of it, though, and will keep experimenting with this technique. 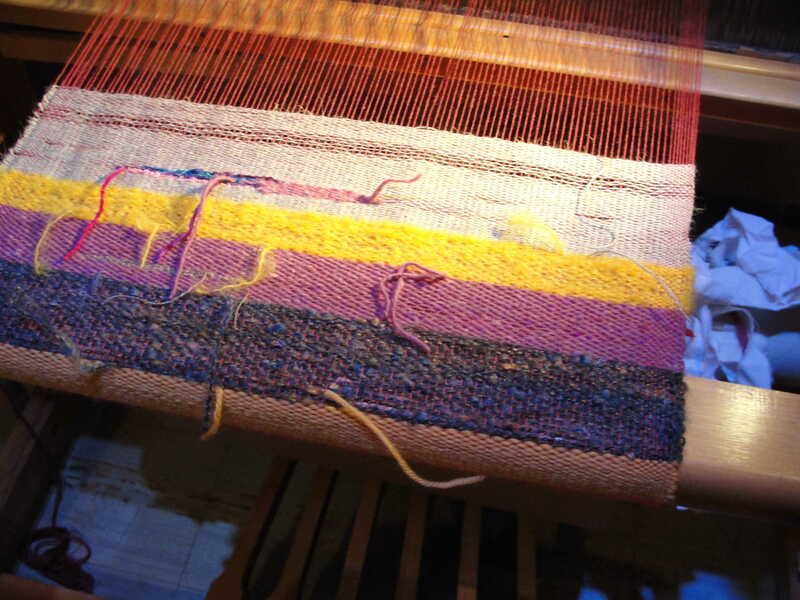 It felt good to work on the loom again. 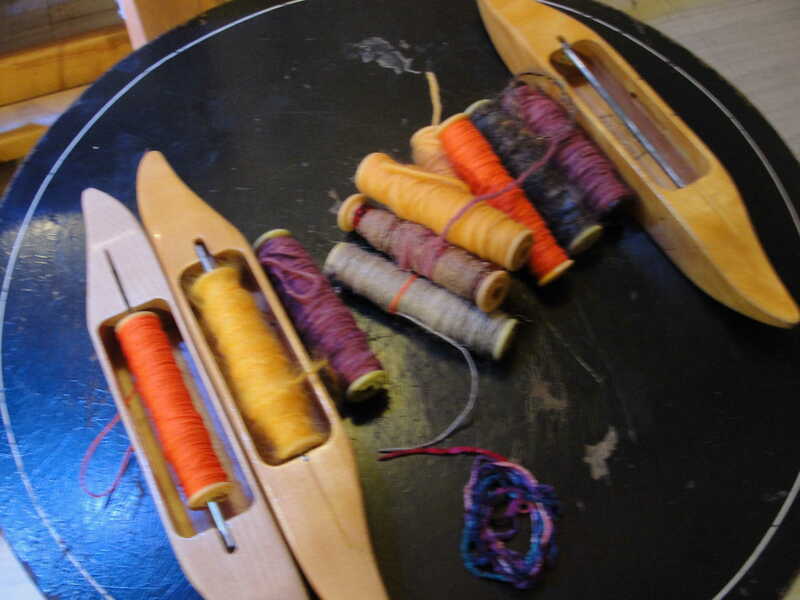 The pictures aren’t the best quality and the colours aren’t very true, since the loom is currently in the basement laundry room with little natural light. Once I’m finished with this warp, I’ll take some better pictures! Thanks! I do, too–I won’t know until I’m finished how it actually turned out. 🙂 I’ve tried a lot of new-to-me things so I’m so curious about whether or not they worked as I planned! I love seeing the work in progress! 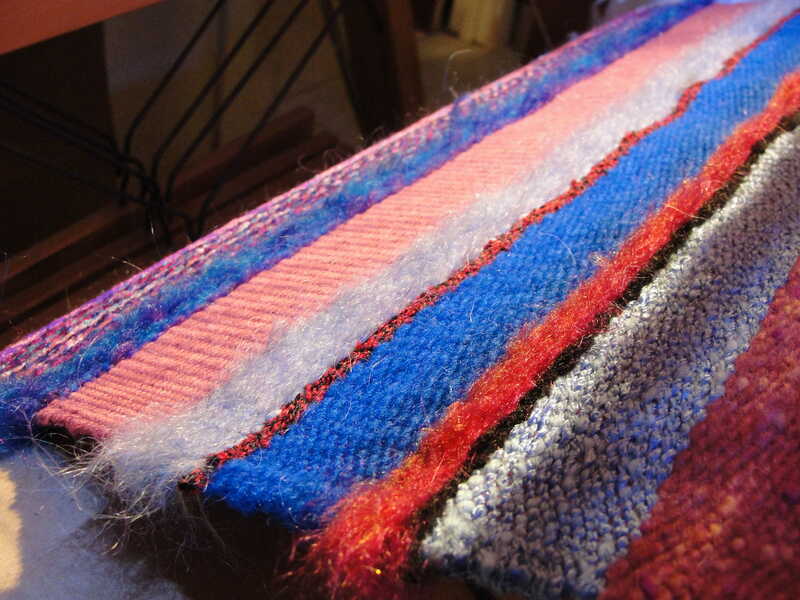 I am accustomed to planning every detail of each piece that I weave. 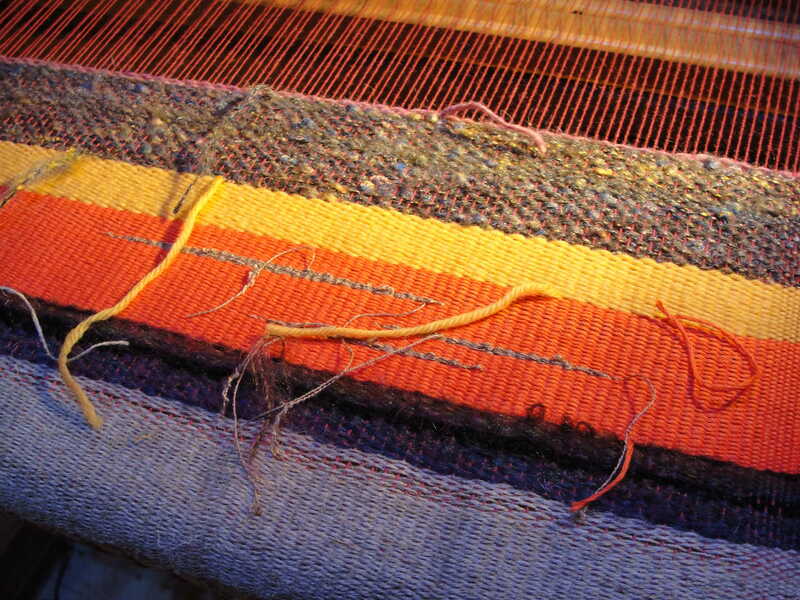 Thanks for your inspiration as you work on weaving more spontaneously. I especially like the random little streaks that you put into the stripes to break them up. Unfortunately, you reminded me of a consequence of hurting my knee a couple days ago. No loom work until it heals? No! Ah, I’m sorry about your knee! Here’s hoping it heals up soon. I’m fairly new to weaving, and I planned my first pieces very meticulously. 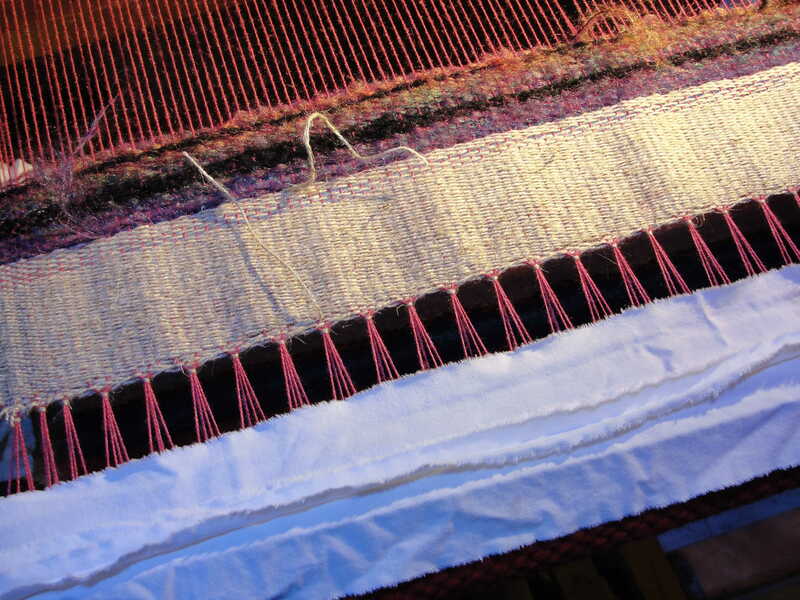 But I acquired this loom with the warp already on (and a handful of the warp threads on the right-hand-side broken in transport), so I grabbed the chance to just play around and experiment. It’s been a lot of fun!